For our official last post on our times in New Zealand (probably our last post), we will finish up our North Island trip with a grand story of visiting New Zealand's largest city, giant sand dunes immense enough to sled down, oceans at war with one another, and some late night cave wanderings. There was so much and it would be so boring to read about it all so we will go to the old usual and show tons of pictures! I will share a little bit though. The drive up North of Auckland to investigate the giant peninsula was really fun. One of the highlights was the Kauri Tree museum where one could find pretty much every single item ever made from a Kauri tree over the past 200 years or so. Tables, desks, stair cases, shelves, all sorts of little objects, and as seen in the picture giant pieces of the actual trees. When we finished the Kauri museum we continued up the coast and saw all sorts of amazing things. There were tons of little artist shops with unique and creative pieces we enjoyed seeing and we ate at some delicious road side New Zealand restaurants. Delicious!! The next highlight was Cape Reinga where the Pacific Ocean and the Tasman Sea meet at the northern most part of the peninsula. It was spectacular to watch as they raged against one another! The waves coming in from the East claimed dominance as their powerful forces swirled in to meet their foe. At the same time crashing peaks of immense power came from the West confident and demanding. The way they met, both unrelenting, was a sheer image of power. I enjoyed the poetic beauty of it and tried desperately to claim a champion among the contenders. It seemed, however at least to my eyes, there was no clear victor and instead only a persistent and continuous war. When we finished admiring the colliding oceans and checking out a beautiful lighthouse, we traveled back South in search of the giant sand dunes we had heard about. We were not so sure about how sledding down sand dunes would be, but it ended up as quite a riot. If we had more energy we would have continued to hike up the dunes over and over again so we could slide back down (at the bottom is a video of Sarah coming down - pretty funny and it really gives the feel of how high up we were). If there are ever giant sand dunes nearby grab a sled and go have some fun - we will meet you there! One last highlight! When Miriam and Gordon were traversing the North Island they went on a wildlife boat cruise to see and possibly swim with dolphins. During the trip they saw not one solitary animal - no seal, dolphin, whale, or any other animal poked its head up to say hello. Because of this they were able to get a free ride to go again, which we were able to use in their stead - lucky us! We gladly accepted these tickets and went for an amazing ride from Kaikoura out towards the sea. 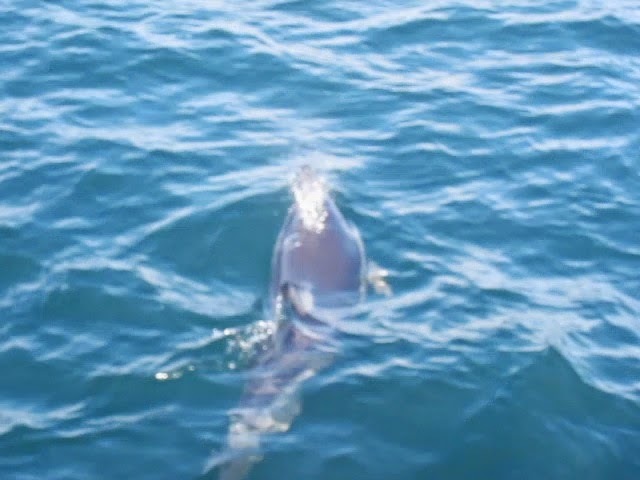 We saw a huge pod of common dolphins, the famous "hole in the rock," seals, and had a beautiful day out on the water. What a trip - thanks Miriam and Gordon! We finished our travels on the North Island with a little Auckland time. There were some really amazing people we met up there and it was certainly a neat city. Please scroll through and take a peek at the pics below. A few of them came out pretty well and capture a good deal of what we experienced. Enjoy.